ORTELIUS -Lumen Historiarum per Orientem. ORTELIUS, A. / MORETUS, B. - Lumen Historiarum per Orientem. Lumen Historiarum per Orientem. - ORTELIUS, A. / MORETUS, B. Title : Lumen Historiarum per Orientem..
Map maker : ORTELIUS, A. / MORETUS, B.. Size : 10.6 x 13.7 inches. / 26.9 x 34.8 cm. 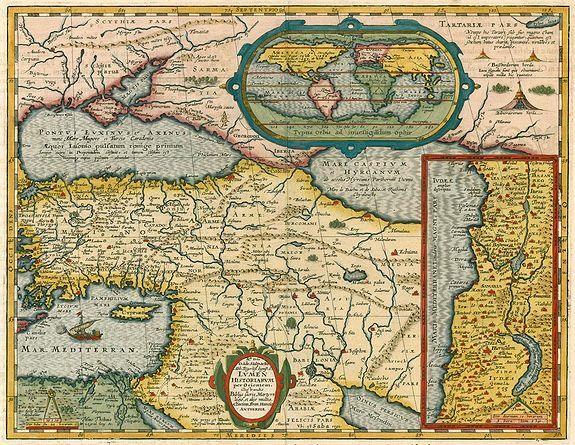 Description :Rare Ortelius map of the Middle East from the 'Parergon'. In upper right corner an inset with a world map. The map is surrounded with letter press explanatory text with placenames, occuring in the bible and other holy writings. Van der Krogt III, 0821H:31. Van den Broecke, 184.